“The MBA program gave me what it took to advance on the career ladder”, says Jarno Eskelinen, who completed the program alongside work, advancing to an executive position in the healthcare industry shortly afterwards. Especially the modules on international funding and business ethics stuck to mind. “In healthcare, values and caring naturally play a vital role. The studies showed me the impact of ethics in business. At the time of conducting this interview, Managing Director Jarno Eskelinen received plenty of good news. His family’s youngest, a baby girl, was born on the same day when HUS Helsinki University Hospital made a decision to acquire a large-scale laboratory automation system from Siemens Healthcare at a value of approximately EUR 25 million. 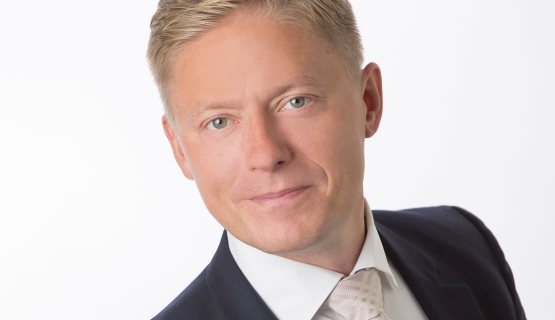 Jarno Eskelinen, Managing Director at Siemens Healthcare Oy (Finland and Baltics), noticed that the MBA degree had a clear effect on his career. He is sitting in one of the meeting rooms of Siemens Healthcare in Espoo. As the company’s managing director, he oversees Finland and the Baltic countries. Before his MBA studies, Eskelinen was offered the role of product manager for US-owned global healthcare company Abbot. He was 27 years of age at the time and had not finished his university studies, and felt it was not the right time to say yes to a role with so much responsibility. He wanted to graduate first. But his employer had a plan: Eskelinen could complete an MBA degree while working and split the cost with the employer. Eskelinen became enthusiastic: “Sounds good,” he said. “I was interested in the focus on economics, and the MBA program at Helsinki School of Economics had a good reputation" (the school later became part of Aalto University). His new employer had completed the same program, recommending it warmly. Eskelinen studied while working between 2002 and 2005. Eskelinen first progressed within Abbot, also working in the company’s German branch in charge of the European, Middle-Eastern, African, and Canadian markets. In 2013, he transferred to Fresenius Kabi, another healthcare company, before his appointment as CEO of Philips Oy. He has been in his current role at Siemens for just over two years. Eskelinen was working on his thesis on social pharmacology when he began the MBA studies. He graduated as Master of Science in Pharmacy in 2002. Eskelinen is from Iisalmi in the Savo region of Finland. He went to a sports high school in the city of Kuopio. His subsequent pharmacy studies in Helsinki aroused his interest in the pharmaceutical industry, and he ended up working in the sector. He feels the MBA program is a good fit with the global pharmaceutical industry. In addition to the actual content, the program taught how to handle pressure and efficient time management. The MBA program also explored strategic thinking and leadership a great deal. Eskelinen has an extensive background as an ice hockey player. On the rink, he has been chosen as captain to lead the team and sort out the occasional trouble between players. You will never do it alone, you need to give a helping hand to others." Eskelinen has advanced rapidly on the career ladder and found himself in situations where subordinates may be older and more experienced. Typically, he has entered the scene to steer a major change. How can trust be gained in a situation of change and uncertainty? “You need to get close to people”, says Eskelinen. “Meet colleagues in Lithuania, Latvia, Estonia, wherever they are. Meet customers, talk to people, build objectives together. It takes a lot of discussion and open dialogue. Not everything can be done from a meeting room in Espoo. I think it’s fair that colleagues see me as a whole. Knowing someone personally increases trust." What leadership skills would Eskelinen like to improve? Eskelinen says that throughout his career, he has tried to get people to talk openly without enforcing his own ideas too much. He is interested in the thought of an autonomous organization that is low in hierarchy. This is perhaps partly because he has been given a great deal of responsibility from a young age and seen the effect on performance, as long as goals are clear. The same method applied to the MBA studies, which brought together a bunch of smart people, who were given the chance to solve issues together.